On our trip to Vancouver in April, 2018, we scouted out Vancouver’s most Instagrammable spots. As photographers, to say we take our Instagram seriously is an understatement. Our Instagram is our online portfolio, and we are very careful about the photos we post on it. Whether you’re a professional photographer, or just looking to step up your Insta game, you’ll enjoy these Instagram-worthy locations Vancouver has to offer. Located in the picturesque Stanley Park, this iconic bridge is the perfect spot for long exposure night photography! The Lions Gate Bridge opened in 1938, officially known as the First Narrows Bridge. It is a suspension bridge that connects the city of Vancouver to British Colombia. In 2005, the Lions Gate Bridge was designated as a National Historic Site of Canada. You can catch this view from the wonderful Stanley Park. Located in the trendy Gastown, the lights surrounding this clock make it fun icon to capture. This spot probably wins the title of Vancouver’s Most Instagrammable Spot. We got this shot below right as two taxi’s were crossing the intersection! Pro Tip: Get there right after the sun sets to avoid the crowd of photographers that gather at this location at night! We have a love-hate relationship with Capilano. On the one hand, it’s stunning. On the other, it costs $40 to get in, and it’s usually pretty crowded. But look at the pretty lights!!!!! Pro Tip: Go in the early morning when the park opens to get Capilano all to yourself! This place inspired me to build my own treehouse home someday. Would you live somewhere like this? 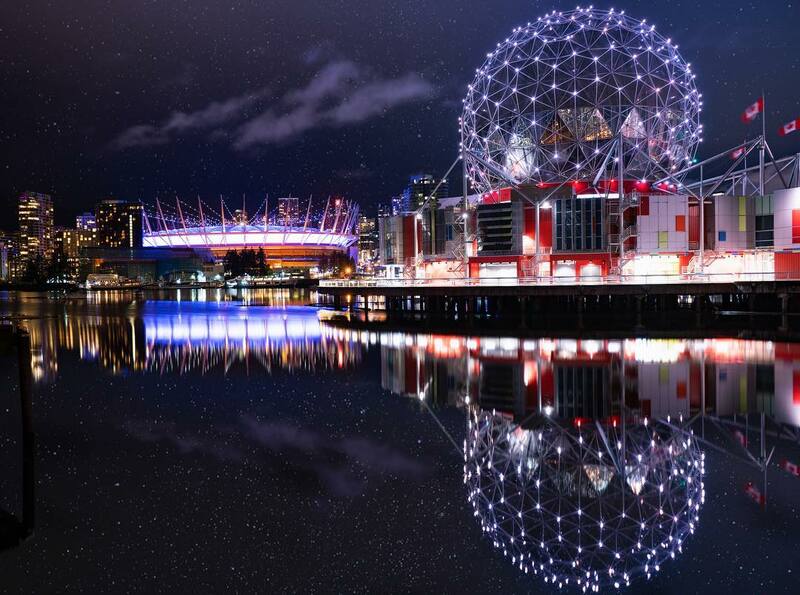 Located in the Olympic Village, Science world’s lit-up dome makes for the perfect Instagram pic! Gastown is located in the heart of Vancouver. With the cobblestone streets and lit up trees, this area is a night photographer’s paradise! Capilano’s lesser-known sister, Lynn Canyon, features suspension bridges, as well as waterfalls. AND it’s FREE! PLUS, you won’t have to fight the crowds to capture the perfect photo. We only saw one other couple the day we visited Lynn Canyon. Right next to Gastown is Vancouver’s thriving Chinatown. Vancouver is home to the second largest Chinatown in North America (after San Francisco’s). We loved the bright colors and all the interesting items for sale in the markets! Whether you’re looking for nature views or to capture the Vancouver skyline, Stanley Park is the perfect location to get that next-level Insta photo. Perception is a tricky one. The person viewing this image may think we are on a boat, a shore line, or maybe even Gotham. Reality lies at the point of what you believe is real, and what is actually going on. So where did this photo take you when you first saw it? Here’s a great one of the Stanley Park Seawall from our friend Nikita Akimov! Vibrant markets and beautiful waterfront views, Granville Island is a must-do experience in Vancouver. It’s also a great night photography location. Check out our friend Nick McDonogh, a.k.a shutter_ninja_. These classical gardens in Chinatown give you the most instagrammable backdrop! This beautiful park in West Van is known for the lighthouse it is named after. But, there are also some lesser-known trails with hidden coves and old growth forests that make this spot one of the most instagrammable places in Vancouver! Yoga in the woods? Can’t think of a better way to start the day! Especially if you get it on a clear day with the mountains in the background! Modeled after the Colosseum in Rome, Vancouver’s Public Library is a modern architectural masterpiece. Located in Canada Place, this Digital Orca statue is beautiful from every angle, especially in this shot reflecting the city lights! This photogenic gem is located in Gastown. It’s especially lovely after it rains! Take a 40-second glass elevator ride up to the Vancouver Lookout observation deck for some breathtaking panoramic views of Vancouver! You’re sure to get some artsy pictures at the Vancouver Art Gallery. Takashi Murakami is a mediator of cultural dichotomies, be it ancient and modern, high and low, religious and secular and eastern and western. Combining traditional Japanese techniques with western and latest technologies, Murakami is best known for his distinctive anime-inspired characters and worlds of explosive neon-colours. The first major retrospective of Takashi Murakami's paintings to be shown in Canada, 'Takashi Murakami: The Octopus Eats Its Own Leg' is on view at @vanartgallery until May 6. #takashimurakami #theoctopuseatsitsownleg #takashimurakamiretrospective #vancouverartgallery #vancouver #contemporaryart #contemporaryartist Installation view with 'Chakras Open and I Drown Under the Waterfall of Life' ((2017), in the rotunda, © Takashi Murakami/Kaikai Kiki Co., Ltd. All Rights Reserved, Photo: Rachel Topham, Vancouver Art Gallery. Imagine the possible photos you could get in front of these jellyfish!!! We hope you’ve enjoyed our post on Vancouver’s Most Instagrammable Spots! Have you been to Vancouver before? Where is your favorite place to take Instagram photos? ?